HIGH SCHOOL IN QUEENS, NEW YORK. SECURING TICKETS FOR THE BOOTH THEATRE APPEARANCE. I NOW HAVE A GREATER APPRECIATION OF THE PRIDE THAT DOLORES HAS ALWAYS TAKEN IN THIS ARTISTIC ORGANIZATION. 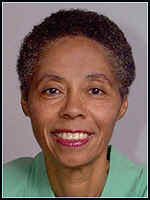 Dolores Vanison-Blakely, a Juilliard graduate with a B.A. in dance, has had a prodigious career as a professional modern dancer, teacher, choreographer and administrator. The connecting thread of Ms. Vanison-Blakely’s accomplishments is a total devotion to her passion – to fulfill herself through her art while simultaneously creating a sacred space where at-risk youth and young professional artists can flower and develop to their full potential as human beings and as artists. Her work as an artist became a vehicle to give to an ever-expanding circle of young people. The Alpha Omega Theatrical Dance School was the sacred space that Ms. Vanison-Blakely co-founded with Ronn Pratt and Miriam Greaves in 1973, a year after she became a founding member of the Alpha Omega Theatrical Dance Company. While shaping Alpha Omega’s dance school at 83 East 4th Street, Ms. Vanison-Blakely also continued her education, obtaining a B.S. in dance from Brooklyn College, an M.S. in Guidance and Counseling from Long Island University and an M.S. in Educational Administration from New York University. The advanced degrees enabled Ms. Vanison-Blakely to replicate the Alpha Omega dance school concept inside the NYC Board of Education when she was invited to create one dance department, then another, in the days preceding the huge arts budget cuts of today. These dance departments together with the Alpha Omega after-school dance programs were the fertile soil that, to date, has produced three generations of Alpha Omega dancers and choreographers, artists and highly successful adults in all fields of business. Among these graduates are Alpha Omega’s Artistic Director, its Associate Director and members of Alpha Omega’s Board of Directors and Advisory Board. Another testament of Ms. Vanison-Blakely’s commitment and love of her students is the fact that over her thirty year career in the Board of Education she remains in touch with twenty-six of her students. Prior to Ms. Vanison-Blakely’s career with Alpha Omega Theatrical Dance Company, she performed as a principal dancer with the Eleo Pomare Dance Company, the Louis Johnson Dance Company, and others. She performed in the Pearl Bailey production of "Hello Dolly" on Broadway, and as a dancer in many off-Broadway productions and on TV. She has been an Adjunct Professor at New York University, and aTeaching Fellow at Long Island University. She created choreography for the Lincoln Center Teenage Workshop "African Tales" and has taught at the NYC Performing Arts Workshop and the East Harlem Teenage Workshop where she produced versions of Bye Bye Birdie, West Side Story, Guys and Dolls, Porgy and Bess and South Pacific. In 1992, Ms. Vanison-Blakely took on the role of part-time Executive Director of Alpha Omega. After retiring from the NYC Board of Education as an Assistant Principal in 1999, she became the full-time Executive Director. In this position she runs its education programs, hire and supervise volunteer and paid staff, work with the Board of Directors, serve on arts panels, supervise fund-raising activities and proposal-writing, manage the organization’s financial and accounting responsibilities as a 501.c.3, and serve as liaison with outside organizations. Ms. Vanison-Blakely has been thrust into an expanded role since the beginning of the capital campaign for Alpha Omega’s Youth Arts Center at 70 East 4th Street. It is a challenge she embraced as she has risen to all of the others before it – with full commitment and determination to master the new skills that the challenge requires of her and of the organization. Ms. Vanison-Blakely is leading the organization she helped to found into a future that gives a sacred, safe space to countless generations of young people to come. The new Youth Arts Center will integrate all the arts, serve as a sanctuary for self-discovery and of a life-long love of learning for today and tomorrow’s at-risk youth. It will help to stabilize and increase capacity for Alpha Omega……. ironically right across the street from the Alpha Omega dance school began in 1973!